What followed was a wonderful conversation about foreign countries and cultures, what they missed most about living in Spain, and how different things are in America. During conversations like these, my military kids amaze me. When I was five years old, I had hardly ever left my home town. Yet these children have lived in three different time zones and two different countries. At a young age, they have an amazingly broad world view. Our family was incredibly lucky to live in Spain. 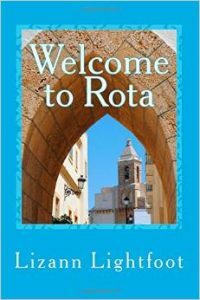 I wrote a book about travel opportunities there called Welcome to Rota . But even if you aren’t lucky enough to get one of the more exotic military postings, you can still get multi-cultural exposure while living on a military base. Even if you are stationed in the same state where you grew up, your neighbors in base housing could be from many different backgrounds and cultures. I have had Filipino friends teach me how to make lumpia and pancit, while my Hispanic friends taught me how to make tamales. Military spouses end up with friends stationed around the world in numerous time zones: Japan, Germany, Guam, Korea, Australia, Bahrain, and Italy are just a few countries where some military families live for years at a time. 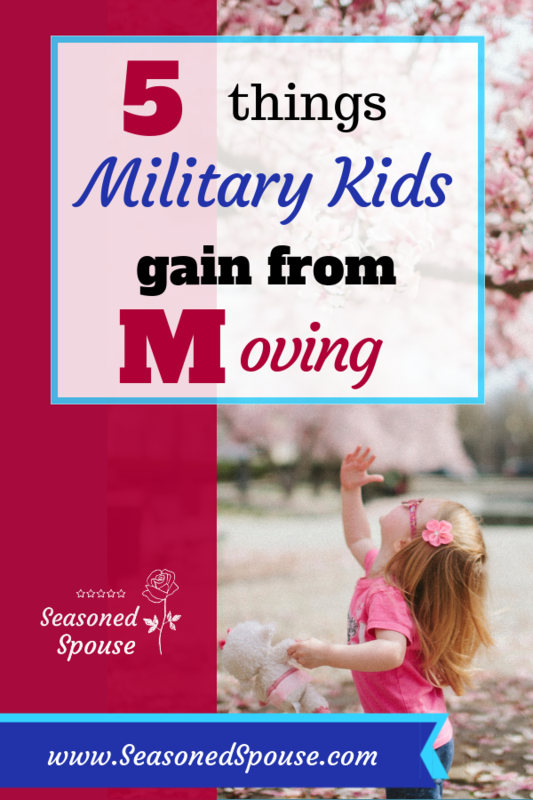 Some people worry about the nomadic life and wonder how it will affect their military children. Moving to a different place every few years means that a military kid isn’t ‘from’ anywhere and doesn’t have a true home. Nevertheless, I think that the value of experiencing different people and various cultures far outweighs the frustration of moving. Military kids who have grown up have proven that they are strong, adaptable, flexible, and very accepting of others’ differences. 1. Broad world view: Military kids have a keen sense of how big the world really is. They have sat through a fair amount of long plane rides. Their classmates are from different states and may have lived overseas. Milkids are aware that people look different in various parts of the world, speak other languages, and eat unique foods. They may have lived in a country that had a prime minister or a king, where the American flag was rarely seen. When you have been exposed to countries besides America, you can see things about your own country with fresh eyes. This video from FB Live talks about military kids: their strengths, challenges, and how we can help them. 2. Accepting of others: Military families are a pretty diverse bunch–different races, religions, and political beliefs. Schools on base are often more integrated and mixed than the schools off-base. A military kid knows what it is like to be a minority in a foreign culture. My kids grew up knowing most people around them didn’t speak English. It was frustrating to them, but they learned that ‘different’ doesn’t always mean weird or strange. What is different to us is normal to others. That helps military kids be a lot more accepting and less judgmental of others who are different from them. 4. Unique experiences and memories: A military kid will always have the best stories to share with friends, whether it is about staying up late and having pancakes for dinner during a deployment, or that time they lived overseas and tried eating snails. Maybe they still have a traditional outfit left over from their foreign dance class or the cultural parade they attended. They know about unique holidays and food dishes. Military kids often say they enjoy being the most interesting person in the class when they start at a civilian school. 5. Confidence in new situations: Finally, most military kids exude confidence far beyond their years. They know how to face new adventures with a brave face. They have been the new kid in class, and have spent months or years separated from a deployed parent. That doesn’t mean every military kid loves public speaking… but there is a strong chance they will be good at it. They also have great odds of landing that future job interview. And if they don’t, they’ll just adapt and find another way. So keep raising strong, adaptable, accepting military kids. They will be confident in new situations and have a broader world view than most kids their age! What are the best qualities of your military kids? 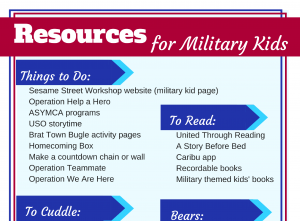 « How can we support military kids?